We are very pleased to announce that the second of our four IR All-Stars for 2018 is Alex Rolfe, Technical Services and Scholarly Communications Librarian at George Fox University. 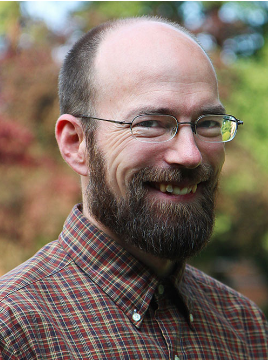 Alex has been key in integrating the repository, Digital Commons @George Fox University, into the campus mission to help students be known academically and professionally, and to promote GFU’s scholarship. Alex has positioned the IR to help foster GFU’s connection to the Quaker community, as well as furthering the larger goals of Christian Education that underpin GFU. One example is the outstanding success of the international journal Occasional Papers on Religion in Eastern Europe (OPREE). Like so many editors of niche journals, Editor-in-Chief Paul Mojzes used to be afraid for the journal’s future. After publishing in Digital Commons @ George Fox University Dr. Mozjes now says he is “levitating with excitement” to see the pins dropping on their global readership map. Alex has also made the peer-reviewed journal, International Christian Community of Teacher Educators Journal (ICCTEJ), feel at home publishing in the repository. Several professors in the Education Department are closely involved with this journal and are relieved to have efficient peer-review tools (in the IR), a full archive of their journal’s issues available, and a wide readership for their work. The president of GFU, Robin Baker, also appreciates the repository’s ability to further institutional goals such as directly supporting students through the publication of open access textbooks. President Baker recently showed off the new OA textbook Intermediate Biblical Greek Reader: Galatians and Related Texts, with over 1,000 downloads. As part of the library’s textbook affordability program, Alex was able to offer Professor Nijay Gupta a way to freely share his work with GFU students and the larger scholarly community. The IR also holds extensive archives of institutional and regional history including manuscripts, documents, photographs, digital records, videos, music, and memorabilia. Alex enjoys preparing IR reports which creatively combine DC Dashboard’s metrics with anecdotes and examples which he shares across campus, embodying GFU’s promise, “Be known.” The Seminary frequently checks their Dashboard metrics and loves seeing how users worldwide are downloading their students’ dissertations and theses. Alex stresses that he is part of a team of librarians at GFU, along with archivist Rachel Thomas, his bepress Consultant Aurora, and student workers who he trains intensively, who all contribute to this success. Join us in congratulating Alex and his team on their success!